During my days of being barred from any form of physical activity, I’ve been reading and playing Angry Birds. Just tossing those cute furry creatures helps me deal with huge amounts of frustration I’m carrying around. Why am I so frustrated?? Marathon training is at a dead standstill. But I can talk about football. Any day of the week. Especially during the “good years” of University of Alabama. Trust me, I’ve weathered several bad years during the late 90’s and early ‘00’s. I’ve sat many a Saturday and hung my head. I’ve had the barcalounger quarterback conversations on Monday. And this was while I was living in TN and surrounded by TN fans. Fans of a team coached by Fat A$$ Fulmer who ran and tattled to the SEC about us then refused to step back in the state limits to testify to his “knowledge”. I hope he chokes on a fried chicken bone. Anyway, we are back in the good years and it just makes the whole town a great place to be each weekend. Cupcake stores are especially fun. Many of you know I’m trying a new cupcake each weekend inspired by the opponent. Naturally, it helps to have a bakery with culinary creativity. 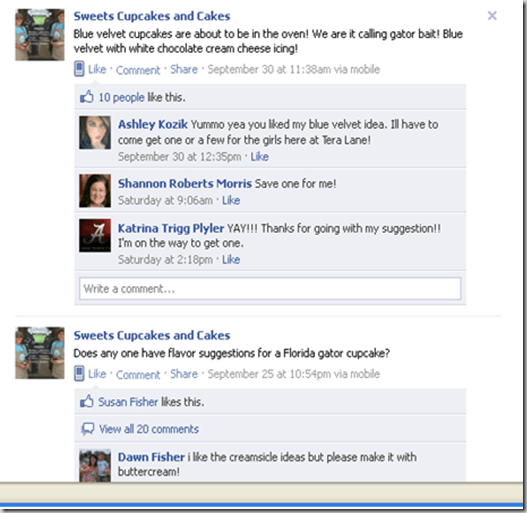 And when their creativity is buried beneath many orders of custom made cakes, they do what anybody would do. . .make a facebook plea. 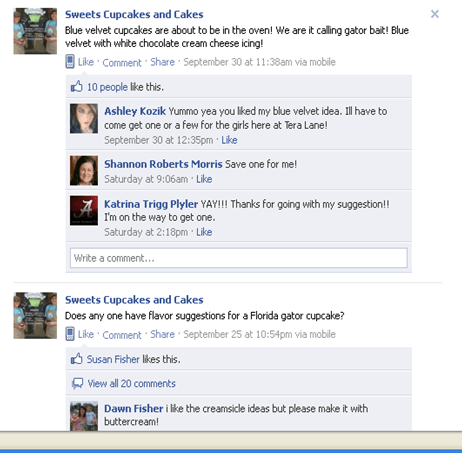 When Sweets Cupcakes posted asking for suggestions about a Florida Gator cupcake, I posted “name it Gator bait!”. 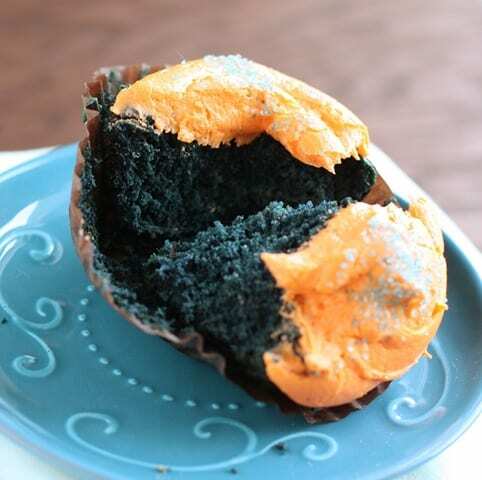 What in the world is Blue Velvet? 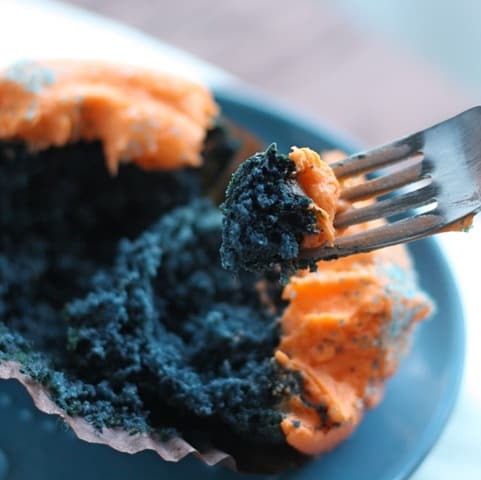 It’s red velvet but with blue food paste or food coloring. Red velvet is a chocolate buttermilk cake with red food coloring. I’ve made red and blue a few times, but my blue is usually a weird green color. I’ve searched about that and found a few people who suggest adding a drop DROP of violet food coloring to get the beautiful blue color. I know I will try this out to see if it works. The orange is orange flavored cream cheese. The post said it was a white chocolate, but they shifted to orange to emphasize the University of Florida colors. 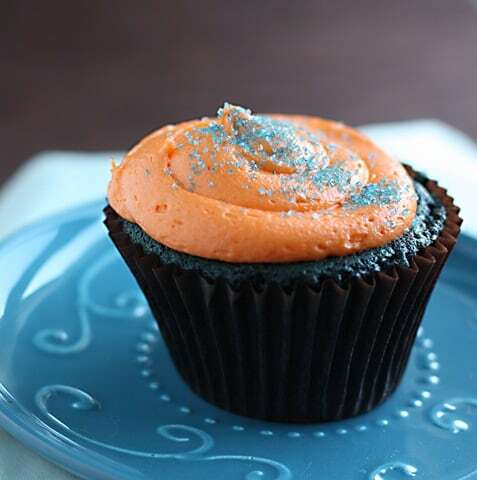 Other than being such a bright pretty color, it is not as sweet as traditional butter cream. I love cream cheese frostings because I can cut sugar and fat from the final mixture. Rhabdo update: CPK levels are at 5,000. I need to be at 1,000. Originally, he said 180. But when I called about my results, he changed it to 1,000 to feel “safe” in releasing me to activity. I can go to crossfit and do the warm ups and stretches and walk during the actual workouts. No weights. No running. No pull ups for a long LONG time. My arms are back to their normal size. Actually, they are 3 inches SMALLER than they were in August. Rhabdo literally ate away my muscles in my bicep. It’s crazy how this happened. I’m working on a more detailed (and hopefully LAST) post on what it is, how I got it, how I plan to prevent it, stats, etc. Anybody who does CrossFit, long runs, marathon training, etc needs to be aware of something that can put you into renal failure with the only symptom being appendage swelling. Until then, look for updates on all the cooking I did! And look for a massive kitchen fail…ugh. Katrina—hugs to you for having a strange and BAD medical situation. Bummmmmmer!! But it sounds like you are doing well. Smash those angry birds. I look forward to the rhabdomyosis information.